Thirteen of black America's most eloquent voices share their visions for a self-sufficient, self-determined future. From Spike Lee's encouragement of independent, community fundraising to Joycelyn Elders's warning about the failings of our "sick-care" system to Stanley Crouch's disputation on "heroic" versus "anarchic" individuality, Black Genius is an exceptional, unique colloquy. 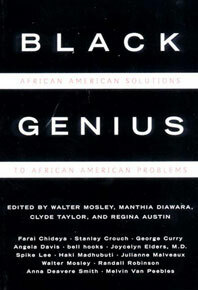 Conceived by acclaimed novelist Walter Mosley and sponsored by the New York University Africana Studies Program and the Institute of African American Affairs, this book originated as a series of community conversations where "visionaries with solutions" shared powerful views on personal and communal struggles, triumphs, and aspirations. The list of contributors suggests the range of perspectives and talents brought to bear on such issues as economics, political power, work, authority, and culture. 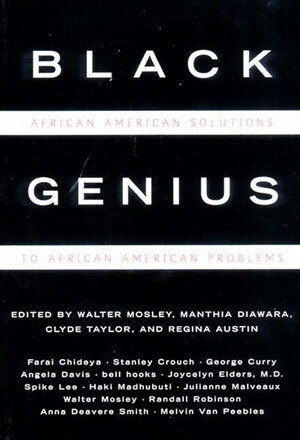 Black Genius is a point of departure for vigorous discussion of our current realities and goals for the future-and a portrait of "genius" that leads the way to enriching American life in the twenty-first century.